Gordon Hall is founder and director of the Center for Experimental Lectures, a series of curated lecture-performances that consider the lecture format itself a creative medium. 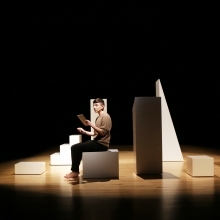 Titled after a quotation from artist-composer John Cage’s 1959 “Lecture on Nothing,” “Read me that part a-gain, where I disin-herit everybody” operates as both a static artwork and an active stage for Hall’s own lecture-performances. These performances explore, in Hall’s words, “the possibilities created and foreclosed by different kinds of platforms, from furniture to politics.” They combine sculptural objects, sound (in the form of a text written and read by the artist on the history of lecture-performance), projected images, and physical action as Hall moves among, on top of, and around the objects. In the photographs on view, taken in Brooklyn, Haiti, Jamaica, and Miami, Deana Lawson depicts her subjects with a deeply intimate and gentle eye. 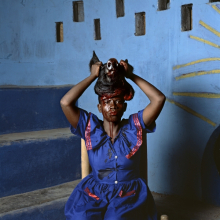 Though she shoots in diverse settings, and her subjects are most often strangers, Lawson’s works are united by what she calls the “familial gaze.” She is inspired by the expression and aesthetics of black cultures worldwide, and her photographs can be seen as psychological portraits of black subjects in an extended, mythological diasporic family. Using a large-format camera, and working across a variety of photographic traditions, including portraiture, staged scenes, found or appropriated imagery, and vernacular photography (e.g., family albums), she addresses themes of the body, sensuality, community, and spirituality, among others. 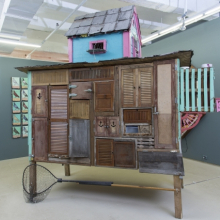 For the installation Archipelago, Marie Lorenz traveled New York City’s waterways from Barren Island in Jamaica Bay to her home in Bushwick in a plywood and fiberglass boat she designed and built herself. With cameras connected to both her body and the boat, she captured three different views of the same route. Considering the tide a collaborator, she collected objects it had “arranged” along the shore to add to the installation. By presenting unusual perspectives that bob, float, hover, and expand our field of vision, the work invites us to see the city anew. 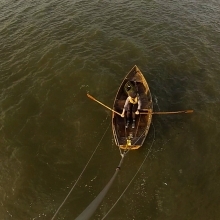 In a related ongoing project she calls The Tide and Current Taxi, Lorenz also takes passengers out in New York Harbor in a rowboat, documenting the trips in picture and story at www.tideandcurrenttaxi.org. For Trading with the Enemy, Duke Riley spent eight months breeding and training a flock of homing pigeons in order to transport illicit cigars from Havana, Cuba, to Key West, Florida. Homing pigeons are not detectable by the high-tech surveillance systems used by the United States to monitor international waters, nor can they be prosecuted for smuggling. Of the twenty-three pigeons that set off from Havana, eleven returned safely to Key West from the more than 100-mile journey. Each pigeon wore a carrying device the artist handcrafted out of bra straps. Half the birds, named for notorious smugglers, carried cigars, while the other half, named for famous filmmakers who got in trouble with the law, carried specially designed lightweight cameras to record the flight. A video with the footage they filmed is on view along with the pigeon loft Riley built in Key West, which houses several live pigeons. The pigeons have been given a clean bill of health by a veterinarian and will be cared for throughout the exhibition by trained specialists. ItNot#2-Brooklyn: This is not me. It’s who I became (2014) is a site-specific installation made up of three components on the Museum’s grounds: vegetable gardens, a weekly green market, and an “Energy Hub” station where you can pedal a bicycle to generate power for future use by Project EATS at their urban farms in Brownsville (pictured here) and East New York, Brooklyn. 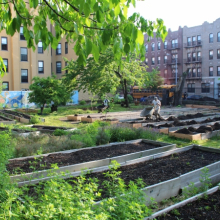 Based on the idea that people can create what they need with what they have, Project EATS is what founder Linda Goode Bryant calls an ArtAction, a “documentary story” focusing on the need for nutritious food in economically disadvantaged urban neighborhoods. Project EATS is a program of the Active Citizen Project, which promotes new modes of public thought and social action. Looking at the cultural economy of African masks—from the vendors on Canal Street selling cheap fetishized replicas, to the decontextualization of African masks in cultural institutions—Brendan Fernandes investigates linguistic and economic aspects of the Western consumption of African art. 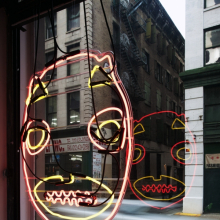 The three neon sculptures on view, which flicker in Morse code, are inspired by three masks by unknown artists in the Metropolitan Museum of Art’s collection and titled after the museum’s accession numbers for those works. The wall vinyl exhibited with them refers to one of the few traditional African artists identified by European scholars, who has been given the name the Master of Buli after a village in the Democratic Republic of Congo. 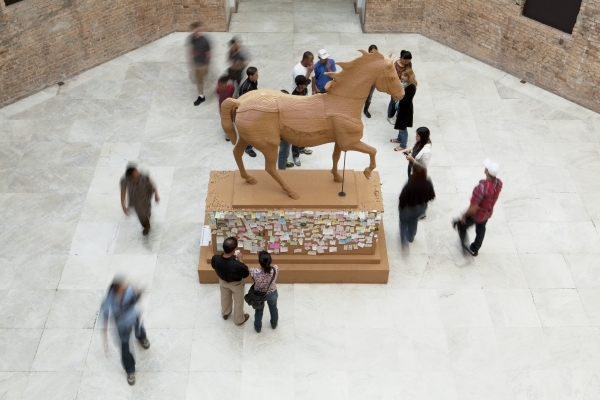 Both the sculptures and the vinyl employ Morse code to ask, among other things, who is the Master of Buli and what is the power of naming? 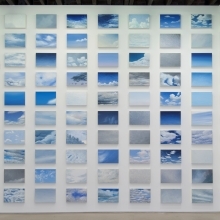 Installed in chronological order, the resulting panorama is all-encompassing, compressing an expanse of time and effort into a single moment. 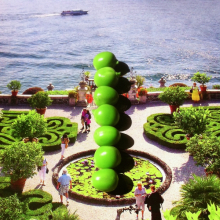 The work’s title is drawn from a line in Joan Didion’s 2005 memoir The Year of Magical Thinking. Like that book, an account of the year following the death of Didion’s husband, Daignault’s project addresses the presence of those who are absent, as well as notions of life and death—the room as afterlife, memory, omniscient vision. While acknowledging Brooklyn’s heightened profile, Crossing Brooklyn presents a multigenerational picture that recognizes the borough’s long-established role as a creative center. Other themes explored in the exhibition include history and memory, place and geography, community, nostalgia, exchange, ephemerality, and politics, both local and remote. The artists included in this exhibition are Yuji Agematsu, Janine Antoni, Nobutaka Aozaki, Daniel Bejar, BFAMFAPhD (Julian Boilen, Susan Jahoda, Blair Murphy, Vicky Virgin, Lika Volkova, and Caroline Woolard), Linda Goode Bryant and Project EATS, Aisha Cousins, Cynthia Daignault, Elastic City (Todd Shalom), Zachary Fabri, Brendan Fernandes, Gordon Hall, Drew Hamilton, Heather Hart, Pablo Helguera, David Horvitz, Yoko Inoue, Steffani Jemison, Matthew Jensen, Nina Katchadourian, McKendree Key, William Lamson, Deana Lawson, Shaun Leonardo, Marie Lorenz, Miguel Luciano, Shantell Martin, Mary Mattingly, Kambui Olujimi, Paul Ramírez Jonas, Duke Riley, Lisa Sigal, Xaviera Simmons, Tatlo (Sara Jimenez, Michael Watson, and Jade Yumang), and Bryan Zanisnik. 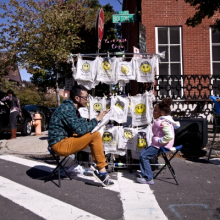 Crossing Brooklyn: Art from Bushwick, Bed-Stuy, and Beyond is organized by Eugenie Tsai, John and Barbara Vogelstein Curator of Contemporary Art, and Rujeko Hockley, Assistant Curator of Contemporary Art, Brooklyn Museum. A catalogue including a roundtable conversation among several longtime Brooklyn artists accompanies the exhibition. 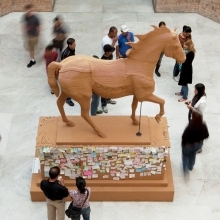 Support for this exhibition is provided by Lambent Foundation, Sotheby’s, TerraCRG, and Brooklyn Brewery. Additional support provided by Hildemarie and Alex Ladouceur. Cross Brooklyn with this video highlighting the exhibition.